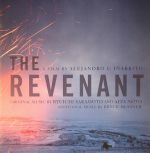 Review: Japanese musical legend Ryuichi Sakamoto composes the soundtrack to Hollywood blockbuster The Revenant. Directed by Alejandro G. INarritu and starring Leonardo Di Caprio and Tom Hardy, the film earned three Golden Globes and five BAFTA awards. Sakamoto collaborates with The National's Bryce Dessner and German multidisciplinary artist Carsten Nicolai aka Alva Noto of Raster-Noton fame. This brooding yet breathtaking musical accompaniment is awe inspiring in all its grandeur, particularly the moments on which Alva Noto appears to provide his trademark synthesized string orchestra passages, complimented by his glitchy and clinical soundscapes ("Carrying Glass"/"Powaqa Rescue") They're so reminiscent of his legendary Xerrox series. Also features the Northwest Sinfonia (Seattle), Berlin orchestra s t a r g a z e and contributions from John Luther Adams and Eliane Radigue. Review: Planetarium is an intriguing proposition: a four-way, collaborative concept album themed around space (but actually about the human condition), written and produced by alt-rock singer/songwriter Sufjan Stevens, modern classical composer Nico Muhly, drummer James McAllister and jazz guitarist Bryce Dessner. Over the course of two slabs of vinyl and 75 minutes, the quartet - at times accompanied by no fewer than seven trombonists, for reasons not explained in the publicity material - speed between intergalactic ambience, political prog rock anthems, sweeping modern classical compositions, thrilling electronic/acoustic fusions, luscious piano ballads and lots more besides. Despite the impressive eclecticism on show, the whole thing feels surprisingly coherent thanks to frequent appearances from Stevens distinctive vocals.